Anti Fatigue Mats, Industrial Mats and Commercial Mat Solutions. Tandem Esd Packaging, Inc. is proud to partner with the RHINO MATS brand which is manufactured by Ranco Industries Inc.; a customer-oriented manufacturer of Industrial Anti-Fatigue Mat and matting, including Dielectric Switchboard, Mil Spec Switchboard, ESD, Conductive, rubber, and drain thru mats and matting. Ranco Industries greatest strength stems from a successful formula that combines accumulated industry "know-how", strong research and development, quality control, manufacturing expertise and a passion for bringing innovative new anti-fatigue products to the market. This, combined with their strong distributor relationship with Tandem ESD Sales makes it the branded choice of anti-fatigue mats and matting for many consumers. All RHINO carpets and vinyl mats and matting are made solely in and from material produced entirely in the United States of America. 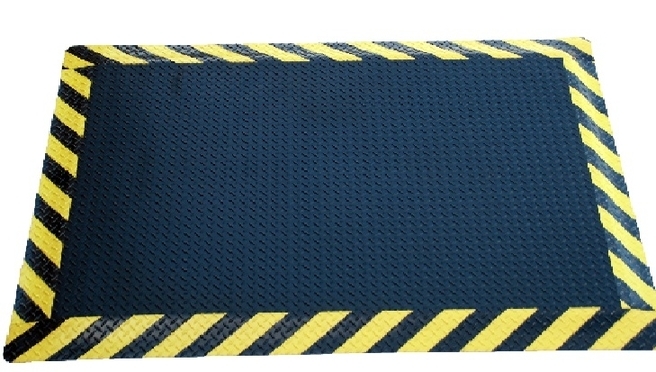 ESD Reflex Anti-fatigue mats | blend of resilient sponge base with a unique molded domed surface provide the simplest and most effective way to reduce standing worker fatigue and dissipate static electricity before it can be a problem. The ESD sponge base encourages subtle movement of leg and calf muscles which in turn promote blood flow back to the heart. 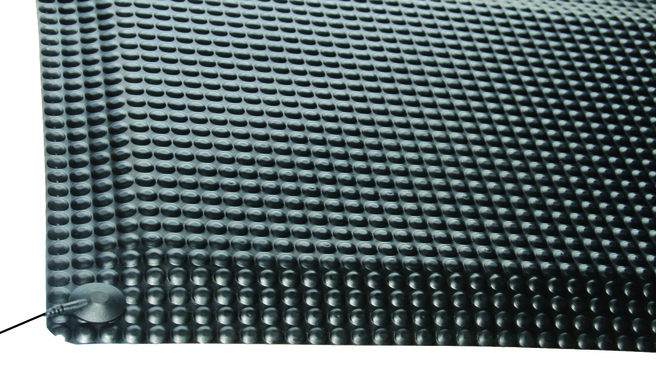 ESD floor mats domed surface of the mat provides a simple manipulation of areas of the feet. This in turn relieves tension and breaks up patterns or stress in other parts of the body to an amazing extent. ESD Mats - Prevent the accumulation of static electricity by quickly draining it from operators and eliminate the hazards of data loss or the damaging of micro-circuitry equipment. Our ESD Mats have a 1/8" thick conductive smooth surface with a resilient closed cell polymeric sponge base. The ESD Matting comes in Your choice: 1/2" or 7/8" overall thickness with beveled edges. This commitment starts with the careful selection of raw materials and continues through the disposal of products at the end of their life cycle. Special emphasis has been placed on reducing the exposure of potentially harmful materials to the environment. Ranco Industries has voluntarily replaced solvents adhesives with water-based and coating formulations. These changes have resulted in the reduction of hazardous air pollutant emissions to levels below the requirements of Title V of the Clean Air Act.